The last twenty years in the English speaking world have seen the rise of a new cultural discourse derived from neurology and neuroscience. Found everywhere in this contemporary moment are cultural products that celebrate these fields: fMRI brain scans, case studies of neurological patients, works of science fiction focusing on cybernetic creatures, films about amnesia, hallucinations, and multiple personality disorders, popular science books, and, not least, an overwhelming imagery of brains, spines and nerves. How we arrived at this moment deserves consideration and contemplation. What is it about neurology and neuroscience that makes such perceptions self-evident? Telling this story requires a history devoted to analyzing the rise of medical and scientific neurology. The Neurologists is that book. When I set out to write my book, I wanted to give my readers an opportunity to answer those questions. At the same time, no comparable book on neurology existed. In beginning my research, I felt very much at sea. What historically had been the differences between neurology and psychiatry? Was neurology synonymous with neuroscience before the advent of neuroscience? How did physiology and pathology fit into the story? Could Freud really be called a neurologist? Such questions were not, and are not, easy to answer. I hope, however, that The Neurologists provides readers with a place to start. Although I realize that many may disagree with my interpretation about the reasons underpinning the specialization of neurology into a branch of medicine, I suspect many new scholars interested in these topics will find it a useful place to begin. The Neurologists focuses chiefly on Britain. It describes the ways Victorian physicians located in a medical culture that privileged wide knowledge over narrow specialism came to be transformed into the specialized physicians we now call neurologists. As the subtitle of my book, The Neurologists, emphasizes, physicians with interests in the nervous system often worked and practiced as either consultant physicians without a specialty or as general practitioners. While their interests in the various sciences and medicines of the nerves – pathology, physiology, psychiatry, alienism, and neurology - might well suggest a specialist identity to us now, these physicians did not understand their work and interests in so sharp a fashion. Indeed, I argue in my book that the normative limits placed upon their professional identity by work and culture often prevented them from moving in such a narrow direction. The outcome of such limits was that British physicians became neurologists by adopting a professional self-identity that was so wide that it encompassed far more intellectually – in scientific and clinical senses – than the delimited terms of mere specialist could denote. They cast themselves as Renaissance men (there were initially no women) of science, medicine, and culture. These physicians fashioned themselves, as one editorial put it, as “savants in the right sense of the word.” It was this broad outlook, integrative mindset, and seeming knowledge of everything that defined the limits of neurology. And for this reason, to our modern eyes the neurologist of the past becomes anyone who embodied those characteristics – whether a man of science, clinician, both, or something else entirely. It was this wide professional identity that culturally situated neurology (and subsequently neuroscience) as bodies of knowledge capable of informing not merely about the nervous system but also about its social and cultural products – the law, religion, philosophy, ethics, economics, and history. 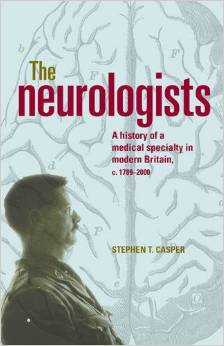 The Neurologists is a social, cultural, and institutional history of neurology in Britain in the modern period. But it can also be described as a history of neurology for neurologists. With some possible concerning values it has even helped students around different areas of interest to bring around more of such values to their projects. I really loved reading your blog. Unlike additional blogs I have read which are really not tht good. I also found your posts very interesting.